Alfonso Cuarón’s Gravity — winner of the Creative Innovation in Filmmaking Award from the NBR in 2013 — makes it easy to forget that filmmakers have not always focused on visual and aural elements when attempting to create visceral theater-going experiences. Incredibly, there were once high hopes for olfactorily-enhanced films. 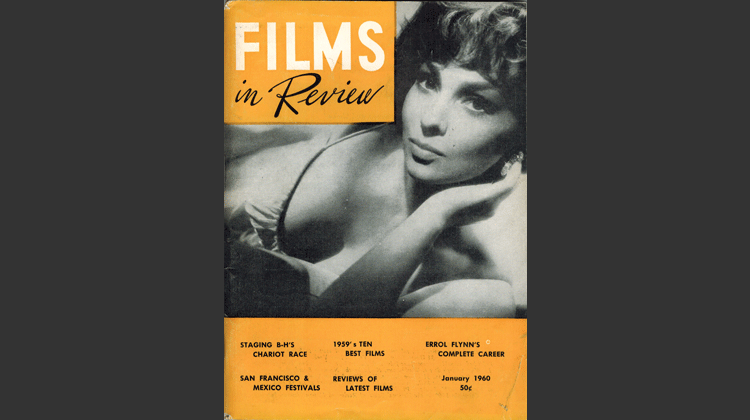 The following is excerpted from a review that was first published in Films in Review magazine in January, 1960. “AromaRama” is the grandiloquent name that has been given to the first effective odor-distributing system for theatres. * It can suffuse a theatre’s air with recognizable and not too recognizable smells, on cue, and clear the air of one odor and substitute another every 90 seconds. As now being used in NYC’s newly renamed DeMille Theatre (formerly the Mayfair), AromaRama is merely a stunt. So was the first motion picture. But coupling an image and an odor has a future, for, as Kipling said, “Smells are surer than sound to make the heartstrings crack.” The mechanics of it have now been demonstrated. The esthetics will follow. 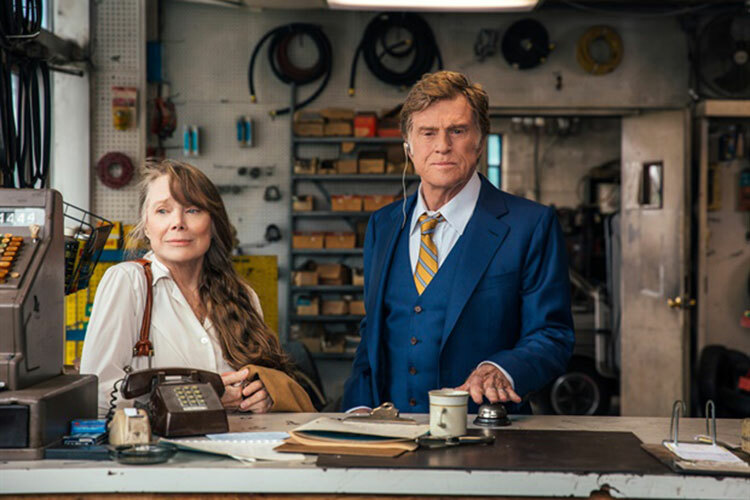 I understand Michael Todd Jr.’s “Smell-o-Vision” will be used to help the audience identify the murderer in the forthcoming film all too cutely called Scent of Mystery. 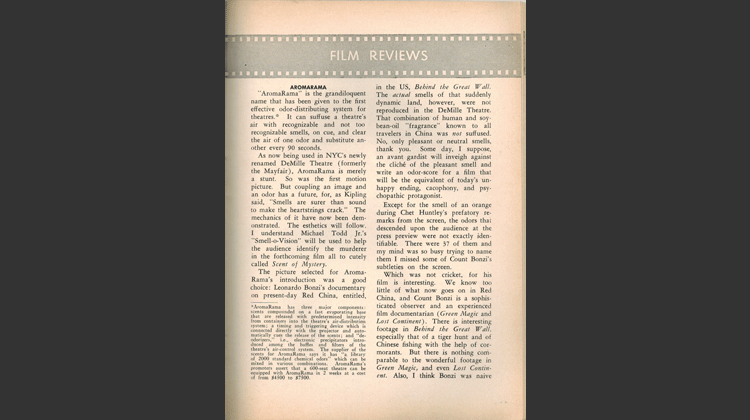 The picture selected for AromaRama’s introduction was a good choice: Leonardo Bonzi’s documentary on present-day Red China, entitled, in the US, Behind the Great Wall. The actual smells of that suddenly dynamic land, however, were not reproduced in the DeMille Theatre. That combination of human and soybean-oil “fragrance” known to all travelers in China was not suffused. No, only pleasant or neutral smells, thank you. Some day, I suppose, an avant gardist will inveigh against the cliché of the pleasant smell and write an odor-score for a film that will be the equivalent of today’s unhappy ending, cacophony, and psychopathic protagonist. *AromaRama has three major components: scents compounded on a fast evaporating base that are released with predetermined intensity form containers into the theatre’s air-distribution system; a timing and triggering device which is connected directly with the projector and automatically cues the release of the scents; and “deodorizers,” i.e., electronic precipitators introduced among the baffles and filters of the theatre’s air-control system. The supplier of the scents for AromaRama says it has “a library of 2000 standard chemical odors” which can be mixed in various combinations. AromaRama’s promoters assert that a 600-seat theatre can be equipped with AromaRama in 2 weeks at a cost of from $4500 to $7500.